Jack was walking in the big park when he saw something rise out of the grassy ground. He recognized what it was immediately. It was a nether portal from Minecraft. He had never been through a nether portal in Minecraft but he always wanted to. He walked through. Jack found himself in another city. He was in a loud party under a tall tower. He soon he realized it was the Eiffel Tower and he was in the past. Jack wanted to go back home but the portal was broken. Jack didn’t know what to do. He sat down on the sidewalk to think. Jack did what he was told. When he turned on the light bulb, there was a bright flash of light. Jack was blinded for a moment. Jack found himself back in the big park. It was the same time as when he left. Jack went home with a story to tell. My name is Megan. I liked your story a lot! It drew me in when something rose out of the ground. I like that after Jack comes out of the portal, he sees the Eiffel Tower. I also that Thomas Edison is there and helps him fix the portal. Your drawing is really good too! Is the guy with the the mustache Thomas Edison? It’s funny that the person is saying “We call this the light bulb”! My name is Megan. I liked your story a lot! It drew me in when something rose out of the ground. I liked how when Jack came out of the portal, he saw the Eiffel Tower. I also like that Thomas Edison was there and helped him fix the portal. Your drawing is really good too! Is the person with the mustache Thomas Edison? 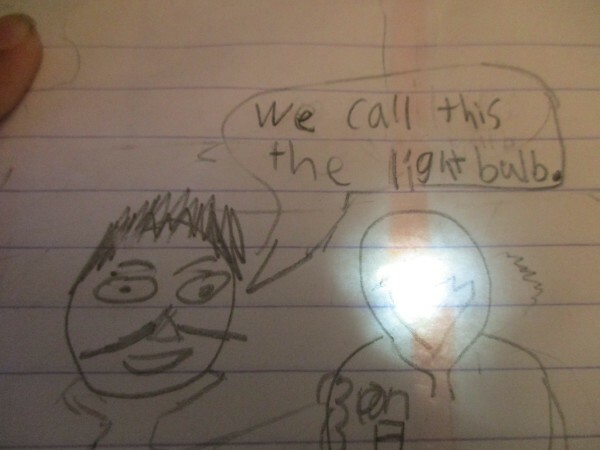 I thinks it’s funny that the guy is saying, “We call this the light bulb”! Hi Michael! My class and I read your story, and we think that you did a good job including a beginning, middle, and end. We would like to hear more about how Jack actually turned on the lightbulb when he got back to the portal. Also, it made us think about some movies that we’ve watched where the characters travel back in time.